I’ve had so many people interested in trying alcohol ink for themselves! Fluid art can be really therapeutic, so I’d love to share my supply list with you! This page contains affiliate links, and a small portion of any purchase from the links go to Lindsay Gill Art. Thank you for your support! 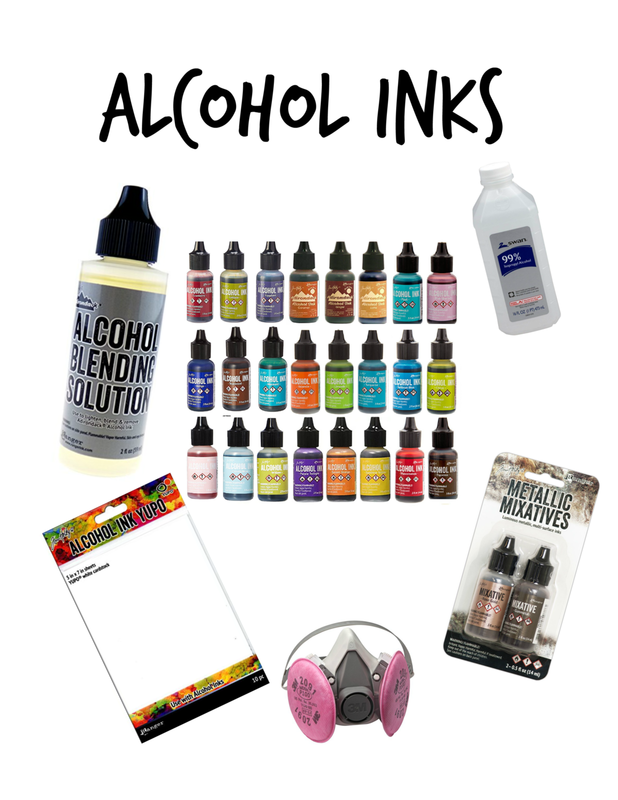 I have had best luck with Tim Holtz alcohol inks, but other artists have recommended Copic and Pinata brands. My favorite color to use is “lettuce.” Definitely purchase some blending solution, but you can also use rubbing alcohol for a different look. I have added the heat gun that I use, but you can also use a hair dryer (with caution as these materials can be flammable!) You must work on a non-porous surface, so you can use Yupo paper, ceramic, or coat a canvas in latex paint, otherwise the alcohol ink eats right through! Wear a respirator and work in a well-ventilated area, these get smelly! The mixatives have been more of a challenge for me, but the pearl, rose gold, and gold can add such beautiful details, and are worth a try, too! ArtResin claims to be the safest resin and is okay-ed for in-home use. I still have been wearing a respirator. The heat gun can be used to eliminate bubbles. Definitely use gloves and protect your skin and working area! Embossing is so much fun! I’ve included some embossing items including my heat gun and a “magic pillow” that prevents stray embossing powder. I wouldn’t even try embossing without that pillow! I like the Ranger embossing powder and have best luck with the super fine types. You can use this on ceramic, wood, ornaments, paper…with best success on smooth and glossy surfaces. Paper and Ink Arts (referral link) is where I go for all of my calligraphy supplies. I like the Gillott 404 nibs best and Turned Wood or Turn of the Century oblique pens. I like SUMI black ink, but have added a thickening agent for certain papers to avoid “feathering.” I can’t work without my SliderWriter, but these tend to be sold out! I originally took an online calligraphy class from Melissa Esplin that can be found at www.calligraphy.org! She has priceless bits of information like that you have to burn off a protective oil on the nibs before starting!